3. 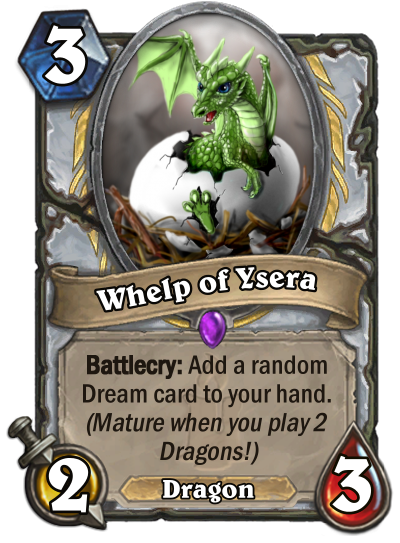 Bristly whelp is a dragon because I got a dragon synergies planned for the kobold and Rastakhan and I didn’t wanted to bring it out of nowhere. Well lore wise there is a section in Icecrown with a captured green dragon (Valithria Dreamwalker) and people needs to heal her to win the game, this is in both wow and hearthstones m. The lore behind it is what would have happened if an agent of the scourge was successful in draining the dragons power. 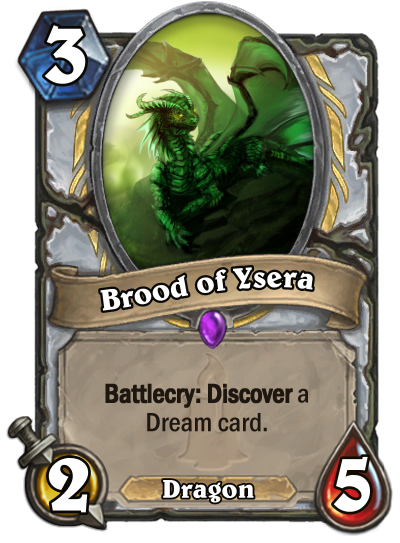 That’s why I took that because I was afraid to step too much into the Druid flavor with the decay and in a way all plantlife in Azeroth is connected to the Dream. But I agree that if I go with that I should make it more spooky. That's exactly what i was thinking, i didn't post it yet because i'm not sure if i want to go with that one. Now that I'm not drowning in Homework, I'll repost my set and give some feedback. Mark of Leo is replaced with Luna Sacrifice. 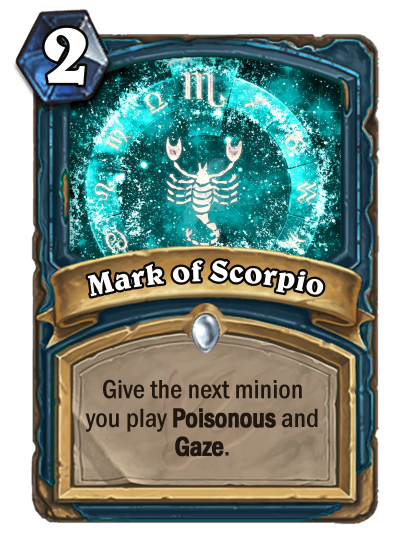 The set need more effect to kill of your own Gazed minion. 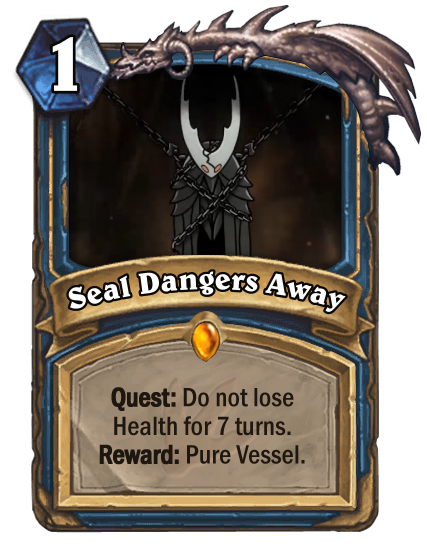 The Quest's requirement is dropped from 7 to 6 minions. I want a Quest that is easy to complete but the reward is less game-swinging like the other classes. 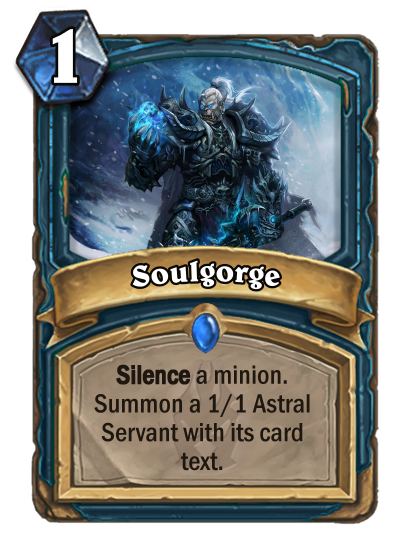 Soulgorge now goes with the 1/1 version. 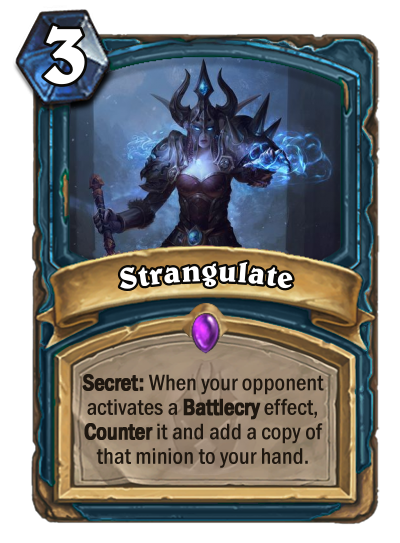 Strangulate now replace Celestial Mindbender. The two sets needs a 3rd Secret to justify having Koltira in the set. ...I still have too many Commons. Elegon: The Elemental synergy attach to a Dragon body theme of the class. The Dragon tag will be useful in K & C. The 7-cost allows it to not compete with The Lich King for the 8 mana slot. 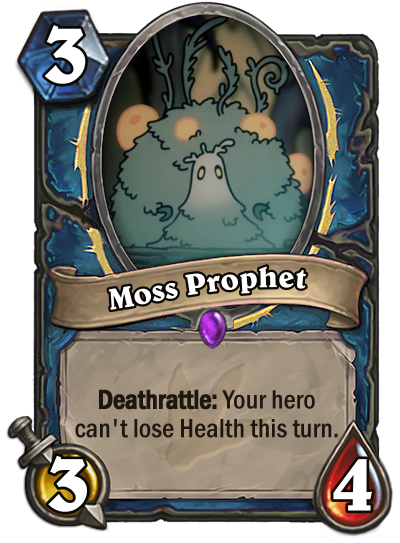 Note that he will also add the Elemental to your hand. Astral Fury: The Elemental synergy for the class. 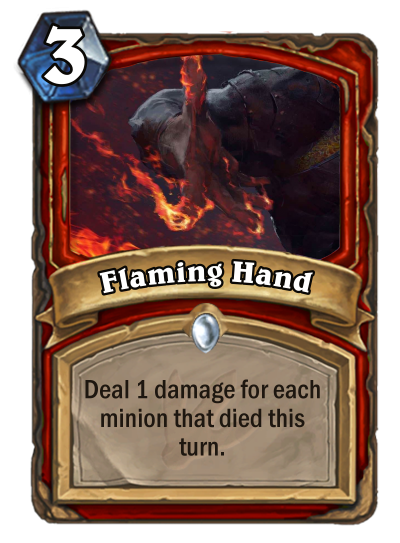 A better Hellfire if you met the condition but broke your Elemental chain. 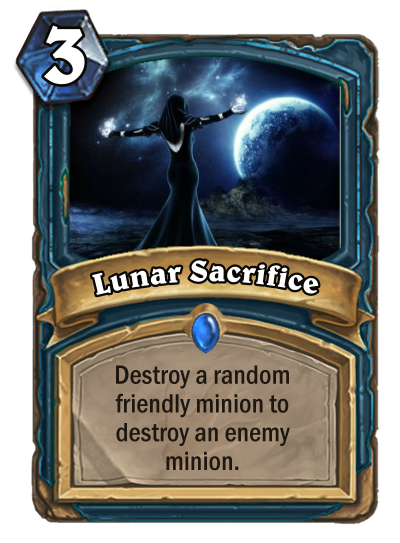 Luna Sacrifice: A way to help complete the Quest by killing off your own Gaze minions as well as serve as a removal. 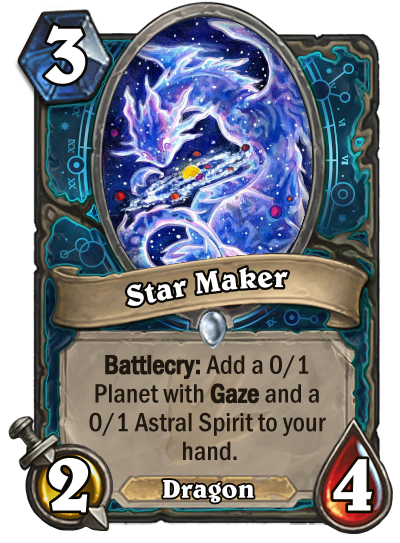 Star Maker: Another card to help fulfill the Quest as well as help with the Elemental synergy since both tokens are Elemental. Minor Tarling: Part of the Tar minions. 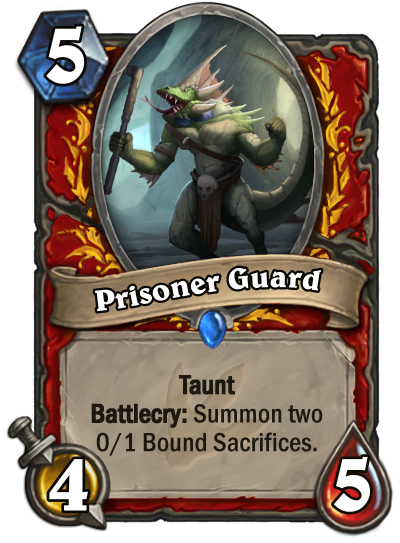 Pain and Suffering: Extremely powerful against this class as it cut off a large portion of token generating card from the boss fight. 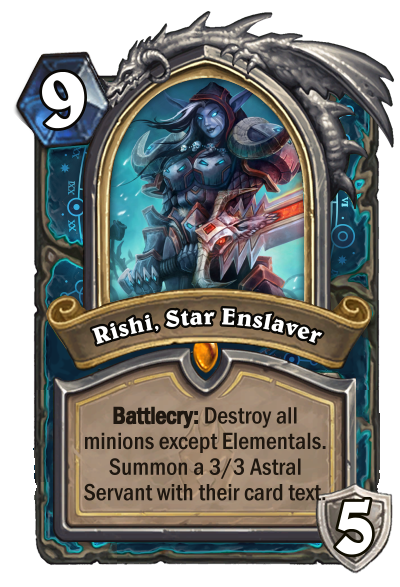 Rishi, Star Enslaver: Probably you can say that the card the class's entire expansion card set is built around. Her Hero Power not only powerful in targeting your minions, but also your opponent's minion as well if you didn't draw your transform effects. 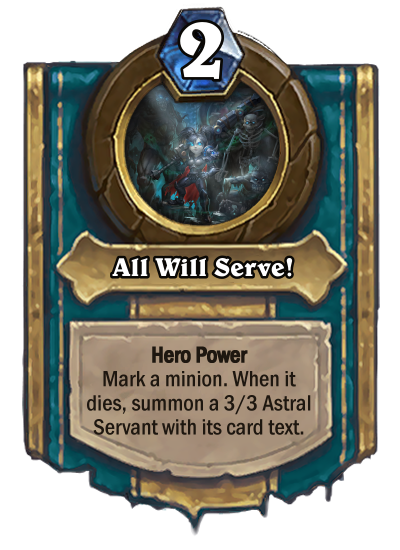 All Will Serve is named after the DK ability of the same name in WoW. The DK fulfill challenge #3 since she doesn't destroy the Elemental you played. Soulgorge: A powerful effect stealing card. Starhoarder and Mark of Cancer allows the class to have good minions to mark with the DK Hero Power. Celestial Subjugation: Continue the theme of stealing your opponent's minions and effect. 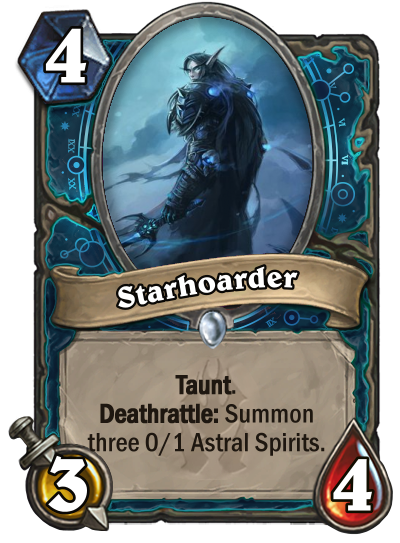 A good inclusion for Spiteful Summoner deck. 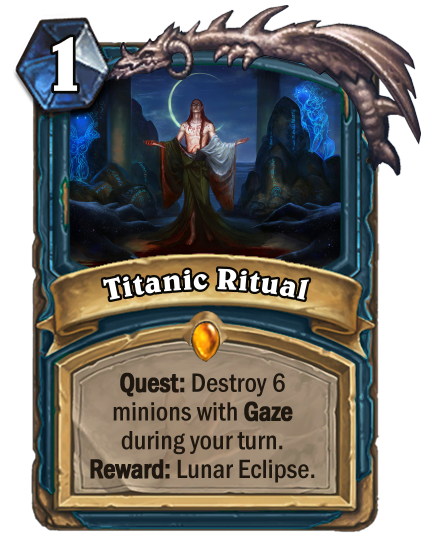 Your Quest Reward need to cost 5 in line with the other Reward. 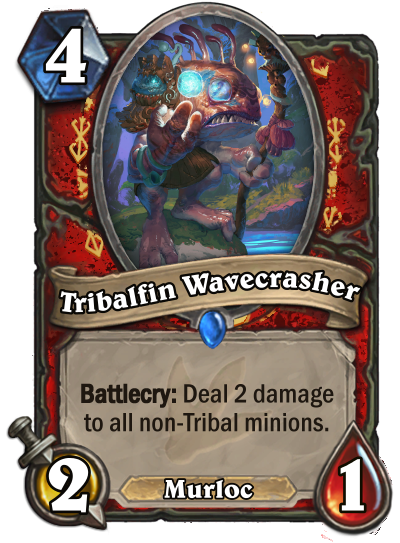 The only exception is the Warrior and that follow the formula of a 3 mana weapon + 2 mana Hero Power. The second version of the Green Pigment is bonker since it is an endless enemy board clear. 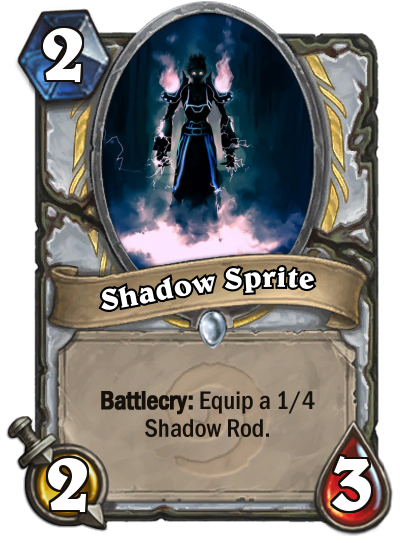 I feel that the anti-healing theme you have needlessly targeting Priest. It isn't healthy for the game especially with a class is notoriously weak for a long time. Spring Revival really looks out of place aesthetically from the rest of the set. Ghost Mushroom has the Neutral border. 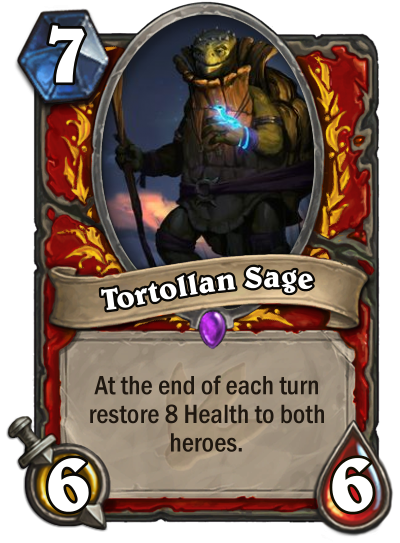 Survival of the Fittest seems like a terrible name for a Quest revolve around reviving minions. Like, isn't Survival of the Fittest means that you actually have to, you know, survive? Hinterland Golem seems really scary. 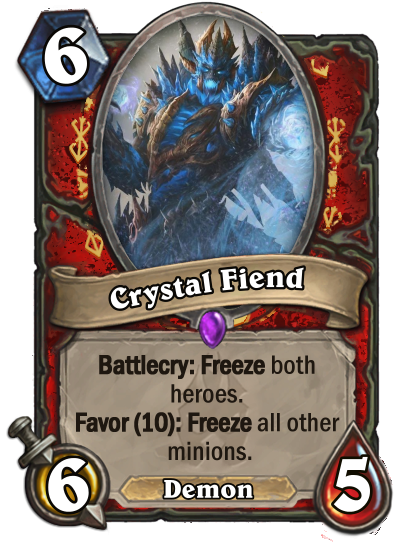 With just the normal Hero Power, you have 2 3/9 minions with Taunt for 10 mana and the Freeze doesn't matter because they have Taunt. 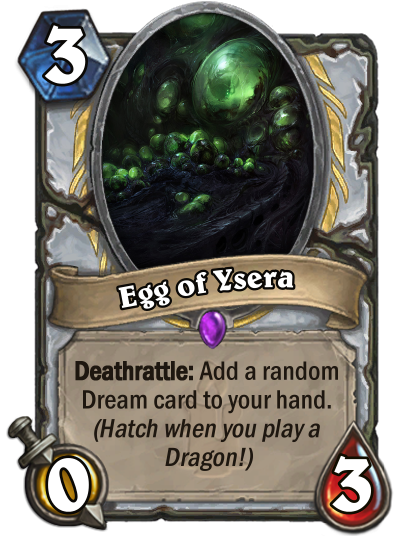 I would make it a 9 mana 4/10. Essence Leech's Lifesteal seems kind of over the top. 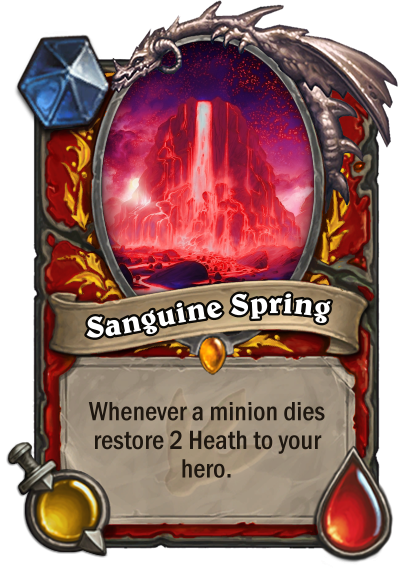 This is especially punishing for big minion since you can have a huge lifeswing for 3 mana and then Freeze it to deal with it later. 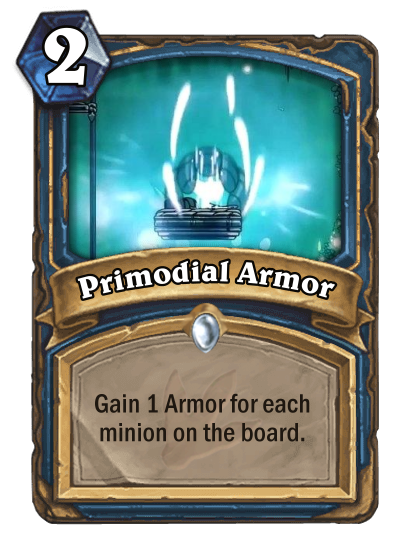 Dinomight seems more like a KotFT card. Scrappy Prowler's art is way too sci-fi. I would change and renamed it. 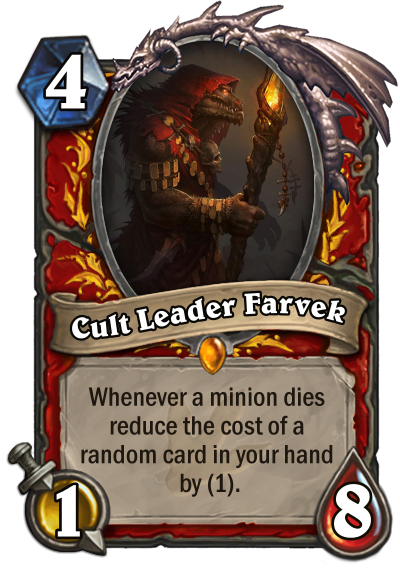 Your KoTF set really need another good 1/1 minion. Your Legendary right now is pretty weak. Grave Homunculus is way too strong compare to (even pre-nerf) Corridor Creeper. 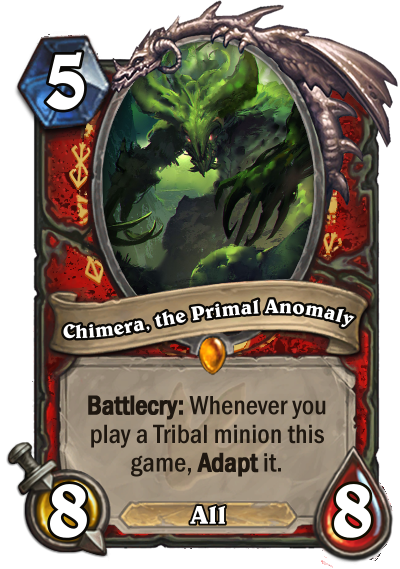 The condition is easier to trigger (which Corridor Creeper is laughably easy to trigger), can attack right away since you will likely summon it the last turn as well as not being an essentially dead card since 4 mana 3/4 is less worse than 7 mana 5/5 (2/5). That was the joke :( Kel'Thuzad is corrupting the very idea of Darwinism. I should put quotations marks around "fittest", to emphasize I mean it sarcastically. I'll give Hinterland Golem another review. Essence Leech has Lifesteal in-part so it can double as a heal, which my class could use more of; it's primary purpose, though, is to keep the spell from being a bad version of Hunter's Mark. 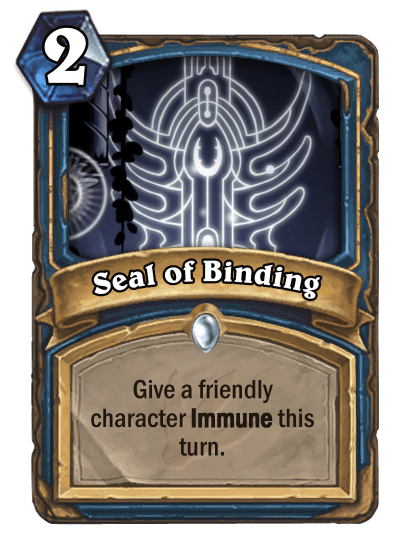 The Lich is pretty lacking in destruction effects and outright damage spells, so for the most part it must rely on a minion trade to finish off the target. 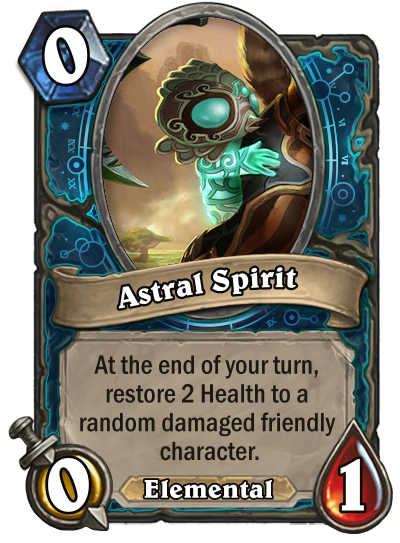 I could increase the mana cost back up to 4, but I want to keep the effect intact. OK first thing Why the nightmare with a Fist Fighter? 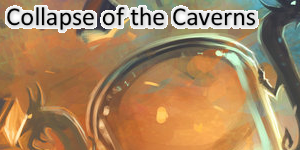 If you are after some lore in game there is a cool quest regarding angry and aggressive gorilla populating a cavern. That will fit more I think. Hey guys! 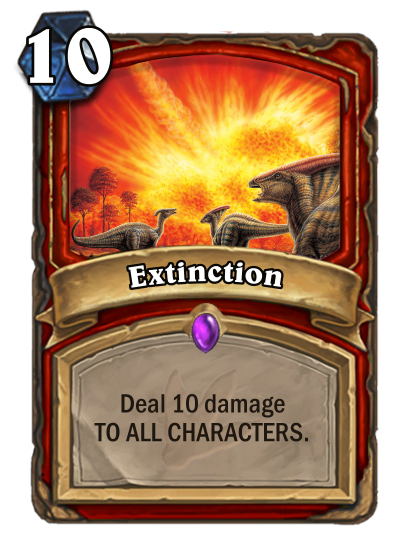 As usual i barely have any time to be around by i got around to completing the Un'Goro set for now. 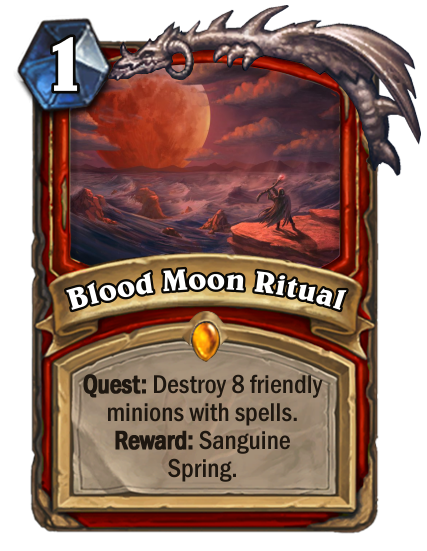 I went for a "crazy jungle tribe sacrifices people to the Blood Moon" theme. You have multiple ways of creating tokens that you can kill to complete the quest and heal from after the quest is done. 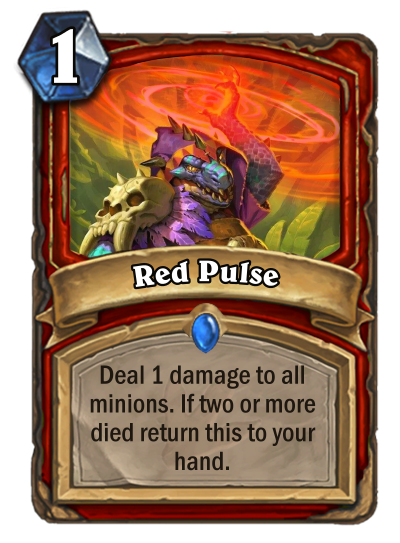 The Red Pulse spell allows for a theoretically infinite way to kill your tokens. 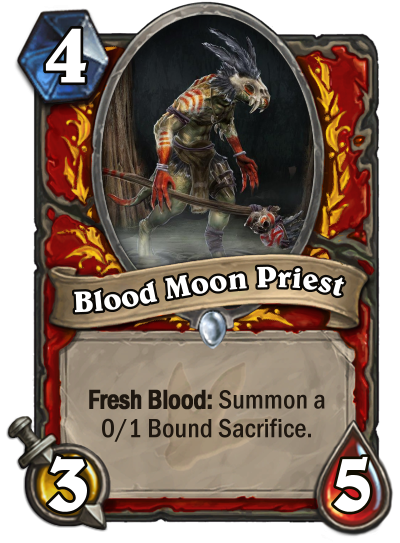 It might be too good at 1 mana though. 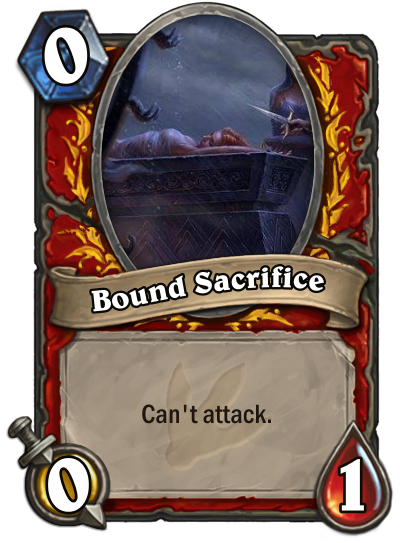 Because the bound Sacrifices can't attack the board-filling aspect of these cards don't go against the Bloodburner's weak board presence. You can't use these tokens to swarm the enemy. They are just for sacrifice. I know i don't really give feedback anymore and it's not because i don't want to, i just don't have time. I'll try to look at a few classes though. I'd appreciate it a lot if some of you could be so kind to give me feedback. 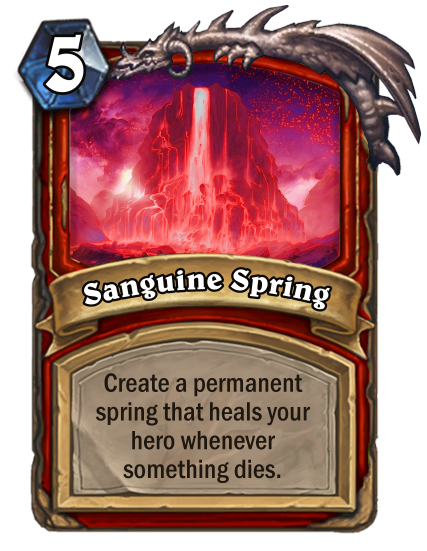 EDIT: Also, how can i get rid of the blank attack and health icons on the Sanguine Spring? 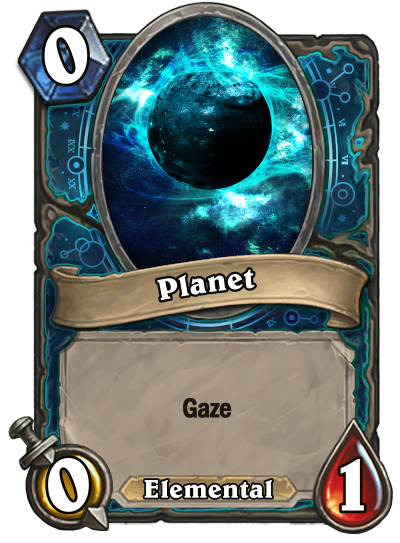 I tried all i could and hearthcards always puts them there if i use a custom class frame. I liked the previous version better. Your class is quite reminiscent of Warlock already, and adding the self-sacrificing theme would increase this issue. Tar Ravager is exactly the Tar Monarch from the exmaple post. You can try and change the stats a bit to make it different. Anciend Legend seems very weak compared to Free From Amber. Crushing Stonewalker is understated. 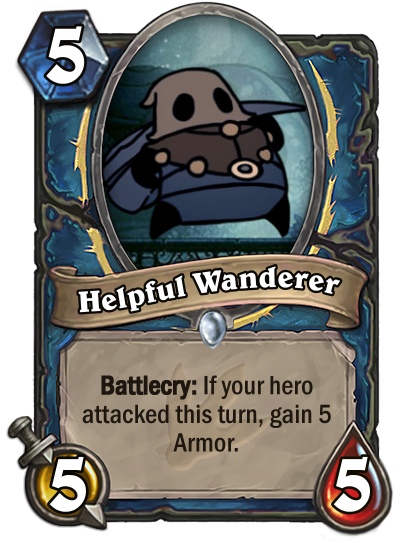 You could try raising his health or making it a 5 cost. The damage gap on Earth Slam makes the card hard to balance. 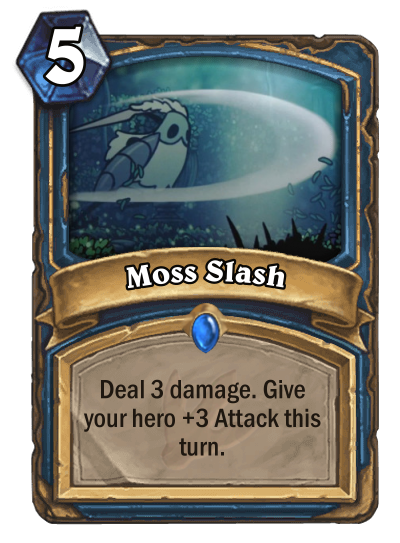 I would make the effect deal 3 damage instead of 4 and lower the cost to 4 or increase the damage from 2 to 3 and upper the cost to 6. 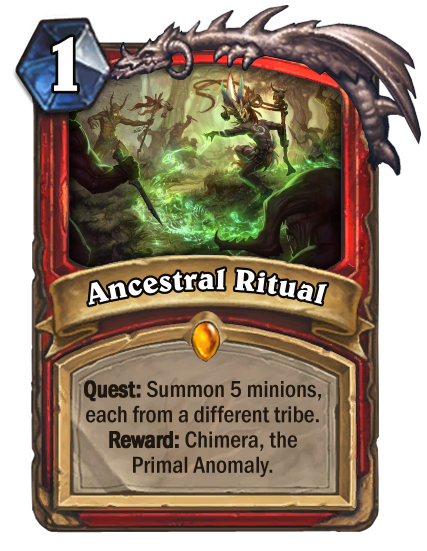 In ancient times, deep in the jungle, fanatical shamans performed a forbidden ritual, sacrificing all kinds of creatures, to open a portal to another plane. As the ritual was finished, an abomination emerged from the void, a chimeric anomaly, perfectly adapted to everything the nature has to offer. Quest Support - There are many things hidden in the jungle, you just need to know how to find them. 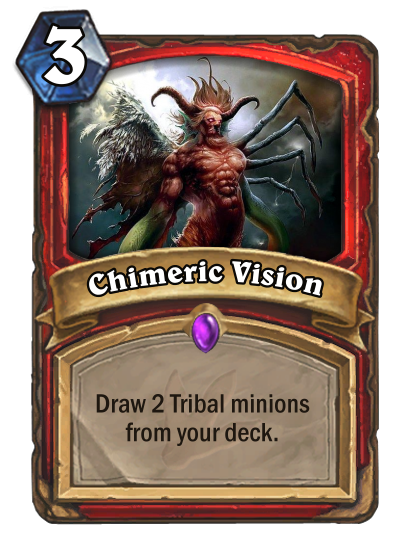 These cards allow you to advance your quest, either by hunting Tribal minions straight from your deck (Dragons, Beasts, Elementals, Murlocs) or by discovering their hiding places within the jungle (Demons, Pirates, Mechs). 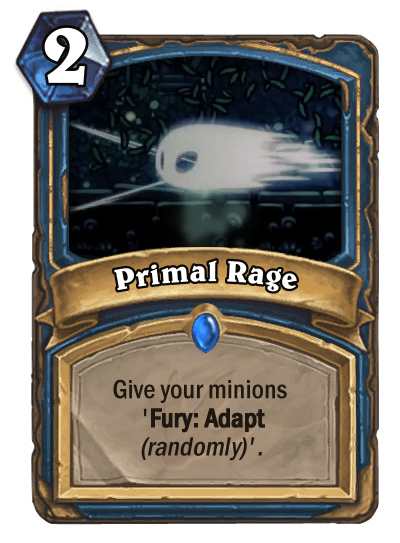 Adapting Spark can be integrated into an Elemental deck. 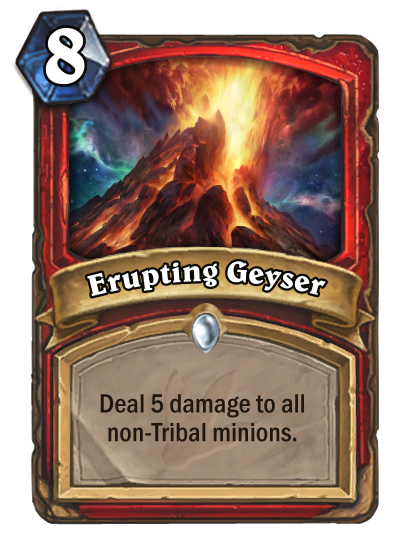 Erupting Geyser is a late game board clear which enables good trades from your minions to assure dominance over the battlefield. Artemis is a good way to end the game with four charging raptors, for a total of 8 damage. Or she can help you stall the game with four taunting stegodons, allowing you to further look for a finisher. 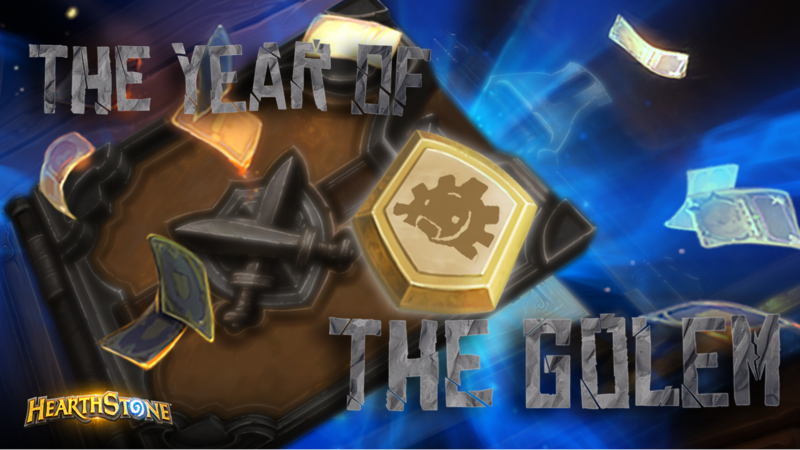 And I still didn't work on KOTFT, but I have most of the cards written down. Feedback is welcomed. Thank you. How I can change size of letters on Hearthcards? You mean in your card text? Place that directly before your card text (no spaces, not on a separate line, directly before) and replace X with a number between 1 and 15. 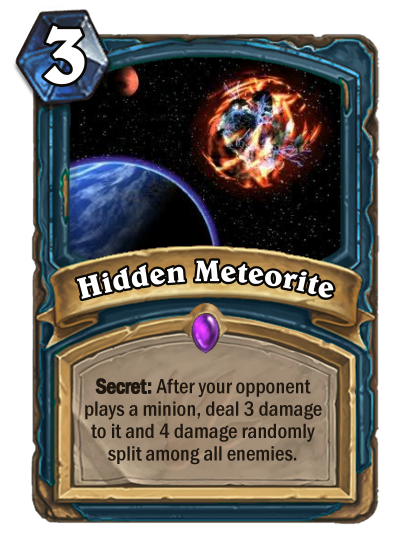 Many elementals's battlecries start with 'if you played an elemental last turn', so Elegon can do nothing sometimes. If those effects would be always active, it would make Elegon better. I don't think that Inspire should appear on Koltira. 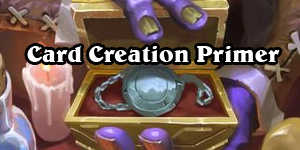 It was exclusive fot TGT and we didn't see its return, so I'd avoid using it. Isn't Obsidian Colossus too good ? 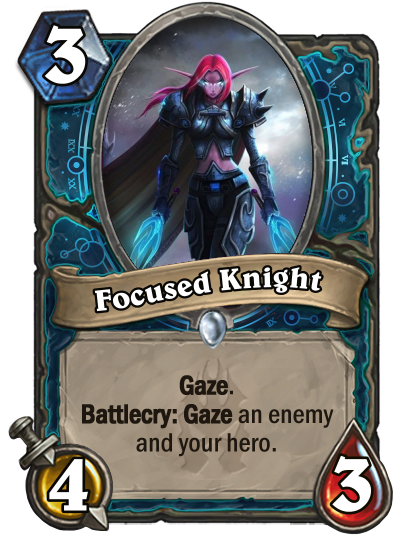 Because you can controll the target with Gaze, there is almost no drawback, and this minion is too god for 5 mana (imo it should cost 6 or 7). I'm afraid that quest is too easy to complete, and reward is TOO powerful. You should nerf Il'gynoth in some way imo. 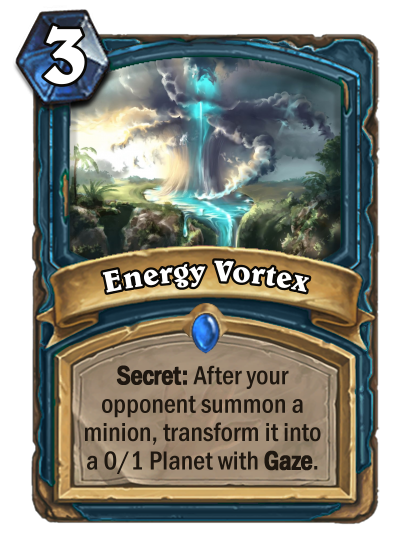 Earth Slam becomes Flamestrike is you played elemental last turn, but costs 5 mana, which is kinda scarry. Does your class have some weapon buffs (sorry I don't remember) ? 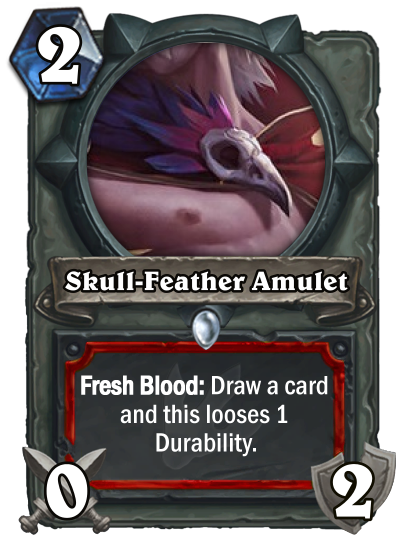 If so, I guess that Skull-Feather Amulet is fine, but otherwise I'd replace it. 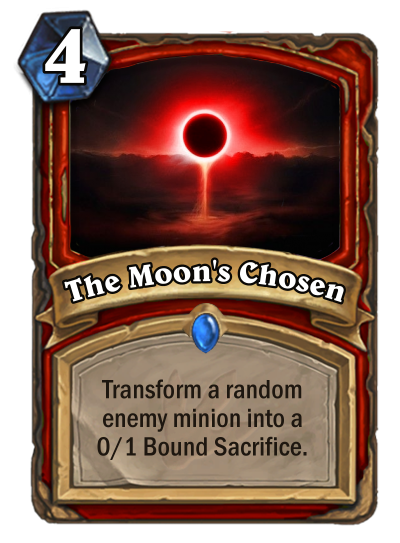 The Moon's Chosen is just worse Hex. I feel like Artemis is a bit too powerful. 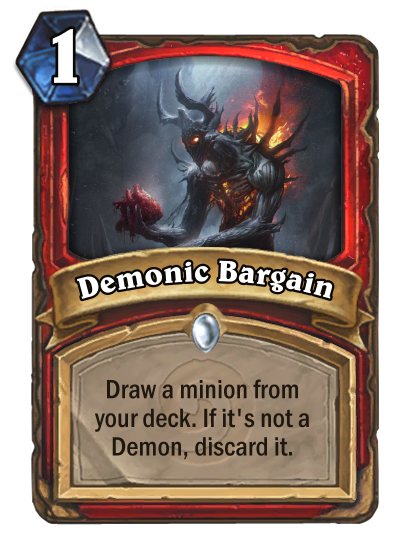 That is so much value for one card. Thanks for the feedback! I think you got it wrong though, The Moon's Chosen is not necessarily worse. 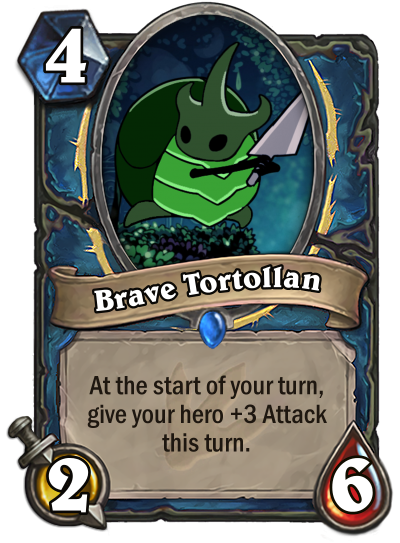 The sacrifice can't attack and doesn't have taunt. I think the problem is the random minion part. It seems unreliable. 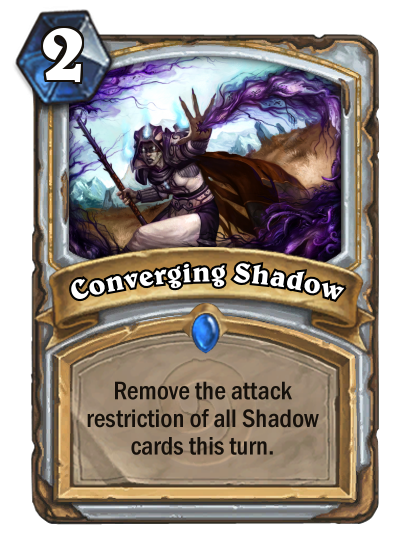 Hex, on the other hand, allows you to choose the minion you transform. 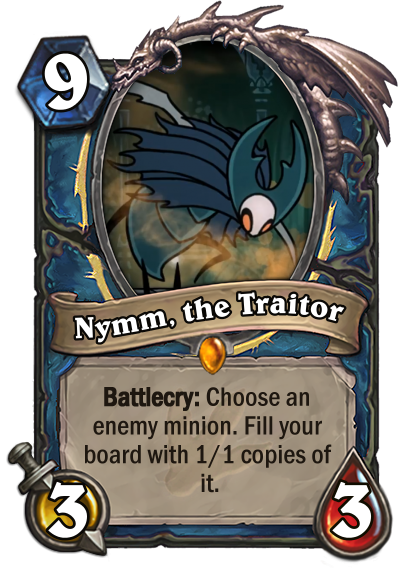 I think you can make Nymm a 4/4. The rest of the cards seem fine. 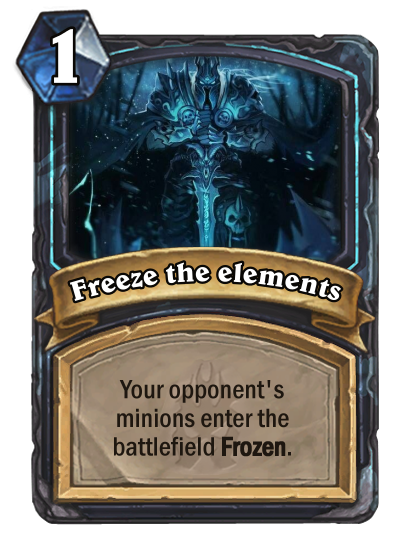 This is my Frozen Throne set, I hope you like it. Any feedback is welcomed. Will work a bit on the art and names of the DK hero powers. Will change the art of Taste of the Frozen Wastes because I have seen it on NiRaSt's card just now. 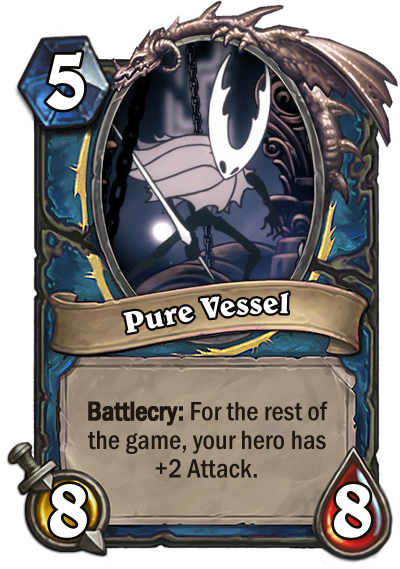 EDIT - I will change the numbers on all hero powers to 3 - draw a card, gain 3 armor - freeze a minion, deal 3 damage to it - summon a 3-3 demon, gain favor (3). 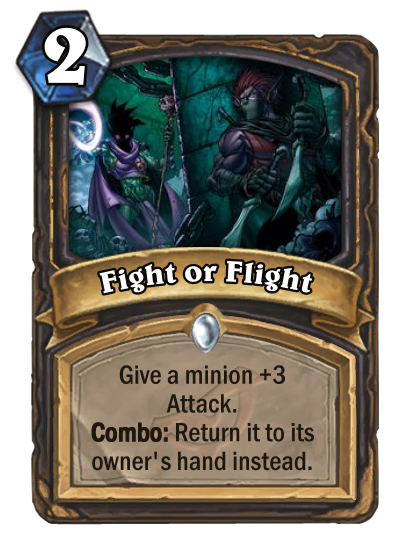 People keep saying that Inspire having not been brought back as a keyword, but Raven Familiar brought back the Joust mechanic for one card. I would argue that bringing back Inspire as a one-off card falls into that line. It's not the same. 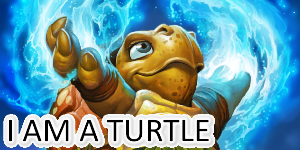 Inspire is a keyword, but Joust isn't. 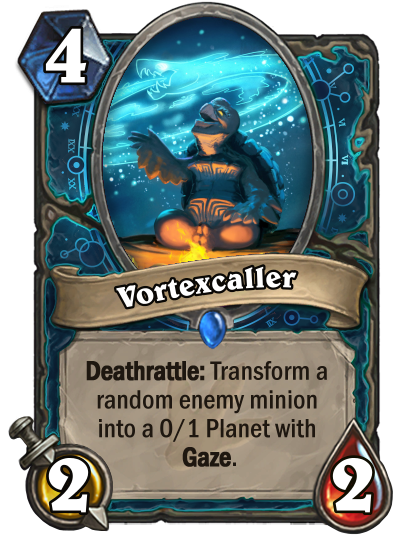 There are several non-keyword mechanics that come back later, like Joust or Forgetful, but the same doesn't apply to expansion exclusive keywords. 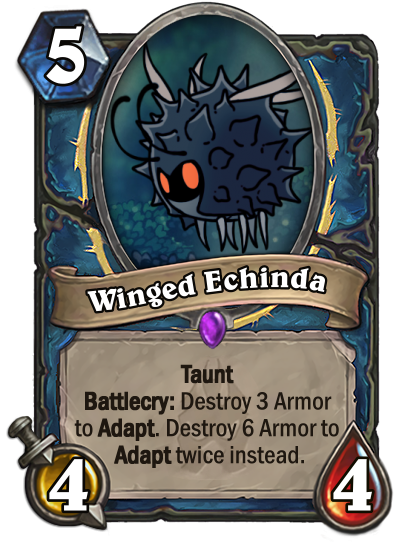 They even go to the point of using a mechanic but not the keyword, like when they don't use Recruit for Finja, the Flying Star or Flark's Boom-Zooka or when they didn't retroactively change Unstable Evolution to include Echo. 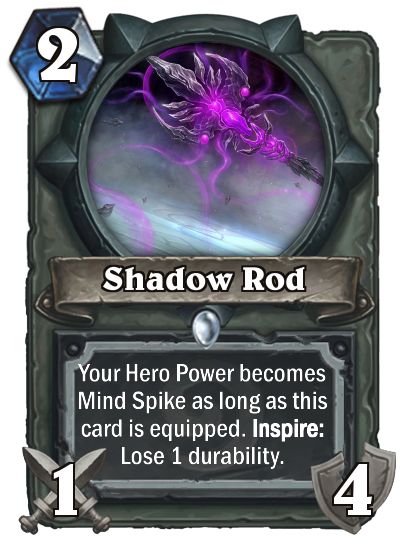 So, I'd say it's ok if you use "Whenever you use your Hero Power", but not Inspire. 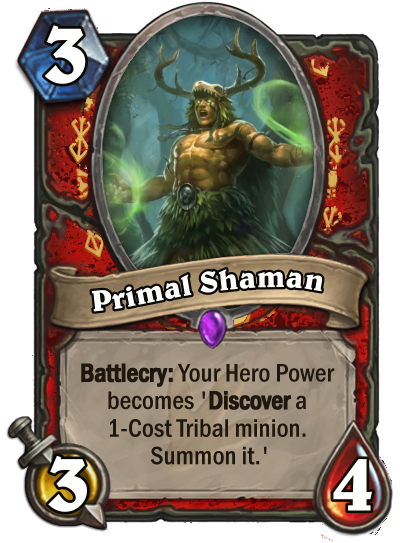 That said, "Whenever you use your Hero Power" wouldn't look good in your card.